© Zhao et al. ; Licensee Bentham Open. A 61-year old man was admitted with a 2-month history of skin rash, and proteinuria and intermittent hemoptysis for 2 weeks. The patient had developed circular erythema and blisters all over the body with scab formation. Edema of the legs and eyelids appeared 2 weeks prior to admission. Kidney biopsy showed membranous nephropathy (phase II) with focal segmental mesangial proliferation and deposits of IgG along the GBM. 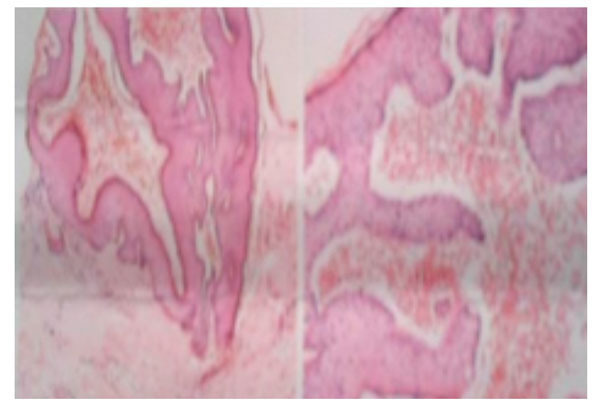 Skin biopsy demonstrated IgG deposits in the epidermal basement membrane zone. The simultaneous development of a rare renal and skin autoimmune disorder, resulting from non-cross-reactive autoantibodies, suggests that a common triggering event could be responsible for the autoimmune injury. This patient with bullous pemphigoid was treated with corticosteroids, which were tapered to an acceptable and effective maintenance dose following treatment with intravenous cyclophosphamide. Keywords: Bullous pemphigoid, immunosupressant treatment, renal injury..
Bullous pemphigoid (BP) is a skin disease that causes blisters. It affects mainly people over 60 years of age. We report a patient with bullous pemphigoid who presented with cutaneous lesions and nephrotic syndrome. 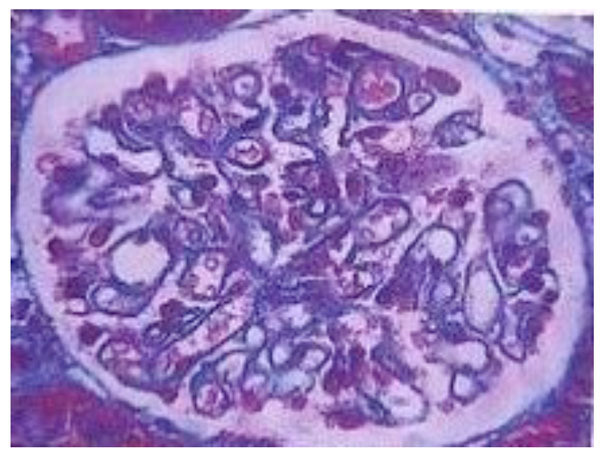 Renal pathological diagnosis was membranous nephropathy (phase II) with focal segmental mesangial proliferation. Treatment with corticosteroids and other immunossupressives effectively controlled symptoms. A 61-year old man was admitted with a 2-month history of skin rash and proteinuria and intermittent hemoptysis for 2 weeks. The patient had developed circular erythema and blisters all over the body with scab formation. Edema of the legs and eyelids appeared 2 weeks prior to admission. The patient was previously well, was not on medication before the skin eruption, had no systemic signs, was afebrile and normotensive. There was generalised circular erythema and blisters with scabs throughout the body. The blisters were firm and dome-shaped, and ranged from 10 mm to 20 mm (Fig. 1). Palpebral and pedal edema and congested throat were present. The white blood cell count was 6.2 ×109/L, with a differential of 78% N, 17% L and 5% M and a platelet count of 2.06 × 1011/L. Urinary RBC of 0-2/HP and 24 h-urinary protein of 7.7 g was present. Serum IgG, IgA and IgM were 7.98 g/L, 1.37g/L, and 1.63 g/L respectively. C3, C4, ALT and AST were normal. The ESR was 60 mm/h. Serum Albumin/Globulin 18.9/27.4 g/L, total cholesterol CHO 11.23 mmol/L, TG 2.55 mmol/L and LDL-C 8.94 mmol/L. Bullous pemphigoid; cutaneous biopsy HE stain (10X). Blisters were seen under the cutis. The capillaries of the upper dermis were dilated and congested, and infiltrated by eosinophils, lymphocytes and plasma cells. Glomerular mesangial cells proliferation, Dilated and stiff glomerular capillary loops were present were dilated and stiff. With Masson staining: small red subepithelial deposits could be observed. 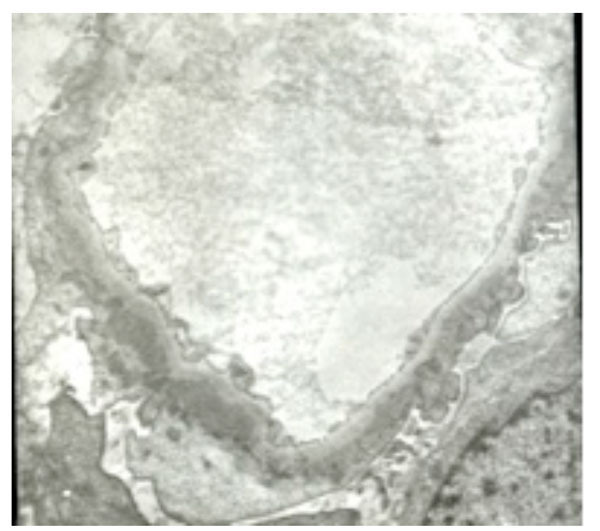 Granular IgG deposits were present along the glomerular capillary wall. Response to treatment of bullous pemphigoid. RF, ASO, ANA, HbsAg, c-ANCA, p-ANCA, anti-MPO and anti-PR3 were negative. The titers of nucleolar pattern ANA were 1：3200. TSH, T3F and T4F were normal. Renal ultrasound demonstrated bilateral normal sized kidneys. Light microscopy of the skin biopsy showed blisters under the cutis, with dilatation and congestion of the capillaries of the upper dermis, and infiltration of eosinophils, lymphocytes and plasma cells (Fig. 2). Renal biopsy showed glomerular mesangial cell proliferation with thickening and stiffness of the glomerular capillary loops (Fig. 3). Renal tubular epithelial cells showed granular denaturation, cystic dilatation and focal atrophy. Proteinaceous casts were present in the tubules. Focal inflammatory cell infiltration and focal fibrosis were present in the renal interstitium. With Masson staining, small red subepithelial deposits could be observed (Fig. 4). Granular IgG deposits were present along the glomerular capillary wall. IgA, IgM, C3, C1q and Fib were negative (Fig. 5). Electron microscopy demonstrated mild focal segmental proliferation of glomerular mesangial cells and matrix, a few deposits in the glomerular mesangium and diffuse thickening of the basement membrane. Scattered electron dense subepithelial immune deposits and spikes could be found. The foot processes of podocytes were effaced and fused. Tubular atrophy was not obvious. Denatured fat and protein were present in the epithelial cells (Fig. 6). 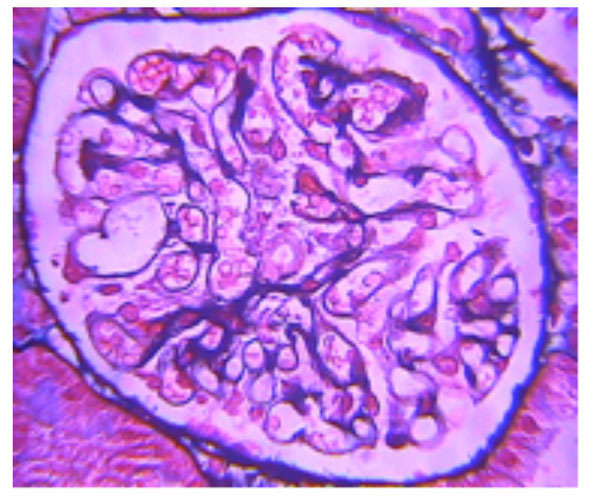 The renal pathological diagnosis was membranous nephropathy (phase II) with focal segmental mesangial proliferation. 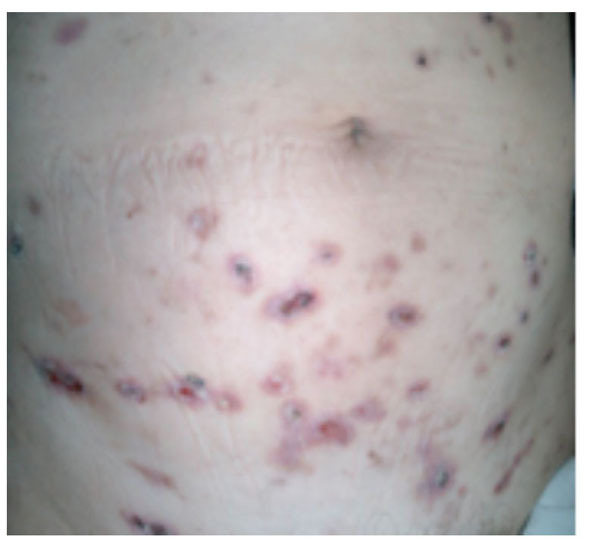 bullous pemphigoid lesions disappeared. Levels of plasma albumin were 35.9 g/L and the 24 h-urinary protein 2.13 g. The titers of nucleolar pattern ANA was reduced to 1:320 and lipid levels and ESR normalised. After 7 doses of intravenous cyclophosphamide over 11 months, plasma albumin increased to 42.6 g/L and 24 h-urinary-protein was normal (33.8 mg/d). The patient was cured after 51 months (Fig. 1). Bullous pemphigoid (BP) is a subepidermal autoimmune bullous skin disease. It is associated with autoantibodies directed against the BP antigens 180 (BPAG2) and BP230 (BPAG1). The pathogenicity of anti-BP180 antibodies has been convincingly demonstrated in animal models. The clinical features of BP are extremely pleomorphic. The diagnosis of BP critically relies on immunopathologic findings. The recent development of novel enzyme-linked immunosorbent assays has allowed the detection of circulating autoantibodies with relatively high sensitivity and specificity . It is mediated by circulating antibodies directed against two hemidesmosomal proteins of the dermal epidermal junction: BPAG1 and BPAG2. Clinical features consist of pruritus and tense blisters usually surrounded by erythema. Blisters sometimes evolve to erosions, become haemorrhagic and can progress to large erosive areas. Lesions heal without scarring. Lesions are symmetrically located on the thighs, legs, trunk and arms. Mucous membranes are usually uninvolved. Histological examination of a skin biopsy specimen shows a subepidermal blister with eosinophils within the blister and the superficial dermis. 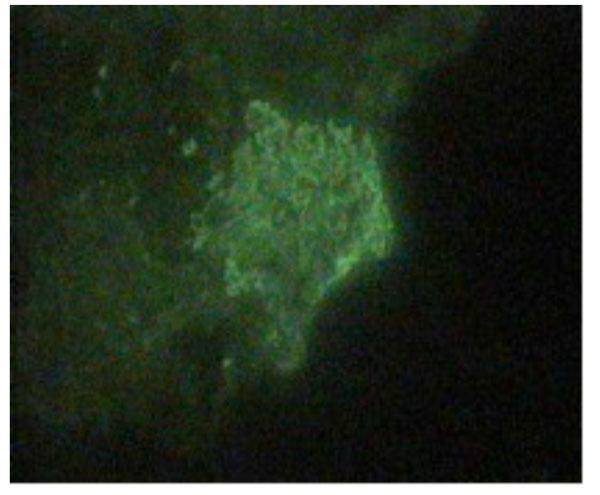 Direct immunofluorescence shows linear IgG and/or C3 deposits along the dermal epidermal junction . Proinflammatory cytokines such as TNF-α, IL-6 and Th1-like cytokines (IL-2 and INF-γ) are not detected, neither as proteins nor as mRNA. Since IL-4 and IL-5 are important in eosinophil chemoattraction, maturation and functional activity, the presence of IL-4 and IL-5 in BP suggest that these cytokines could be important in the pathogenesis of the disease . The patient had deposits of IgG in the kidney and the skin, along the GBM and the epidermal basement membrane zone respectively. The patient's autoantibodies immunoblotted the intracellular domain but not the extracellular domain of BP180. Reactivity of the patient's IgG with BP180 was found only in the unbound fraction of the serum. The simultaneous development of a rare renal and skin autoimmune disorder, resulting from non-cross-reactive autoantibodies, suggests that a common triggering event could be responsible for the autoimmune injury . In bullous pemphigoid, azathioprine and mycophenolate mofetil seem to be equally effective when used in combination with oral corticosteroids, but mycophenolate mofetil is less myelosuppressive and hepatotoxic. Cyclophosphamide still has a place in the treatment of severe relapsing autoimmune bullous diseases. Several pulsed cyclophosphamide regimens have, therefore, been developed and are reported to be effective in severe forms of pemphigus. Randomized controlled studies are needed to compare the efficacy and safety of cyclophosphamide with newer treatment options, such as rituximab and immunoapheresis, and to define optimal dose ranges and duration of available immunosuppressive treatments in different stages of autoimmune bullous diseases . Di Zenzo G, Della Torre R, Zambruno G , et al. Bullous pemphigoid from the clinic to the bench. Clin Dermatol 2012; 30(1): 3-16.
 de Quatrebarbes J, Joly P. Bullous pemphigoid. Rev Prat 2005; 55(11): 1165-8. Feliciani C, Toto P, Mohammad Pour S , et al. A Th2-like cytokine response is involved in bullous pemphigoid.The role of IL-4 and IL-5 in the pathogenesis of the disease. Int J Immunopathol Pharmacol 1999; 12(2): 55-61. Plaisier E, Borradori L, Hellmark T , et al. Anti-glomerular basement membrane nephritis and bullous pemphigoid caused by distinct anti-alpha 3(IV)NC1 and anti-BP180 antibodies in a patient with Crohn's disease. Am J Kidney Dis 2002; 40(3): 649-54. Meurer M. Immunosuppressive therapy for autoimmune bullous diseases. Clin Dermatol 2012; 30(1): 78-83.